Hello, welcome to Ted's Muppet Page! This web page was created to celebrate Jim Henson and the marvelous Muppets! They've been around since 1954! They have made such shows as Sesame Street, The Muppet Show, Fraggle Rock, The Jim Henson Hour, The Storyteller, Dinosaurs and Our Place! And now there's Muppets Tonight!, the new Muppet show, Big Bag, a new show made in association with the Children's Television Workshop that airs on the Cartoon Network Sunday and Wednesday mornings AND The Wubbulous World of Dr. Seuss now airs Sunday evenings at 8PM (Eastern) on Nickelodeon! What more could a Muppet freak want? Sesame Street is still going strong and on November 18 it began it's 28th season! 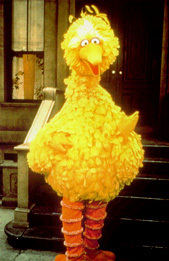 Above is Zoe, one of the newer Sesame Street Muppets. On December 11 I did a bit of an overhaul, adding lots of new graphics, links, a guestbook and generally replacing dead wood with new branches! I hope you like! Tell me what you think! At Andy's Muppet Store, you can buy tons of Muppet collectibles from Andy Wolf. Her E-Mail adress is written down there. Yesterday I was in my local Record Town/Saturday Matinee store looking through the video section, looked up and lo and behold! I saw Emmet Otter's Jug-Band Christmas sitting on the shelf! For those of you who don't remember, Emmet was made in 1977 and aired in 1980 on ABC. It was about Ma Otter and Emmet Otter who each want to buy the other a Christmas present. Each one enters the same talent show (unbeknownst to the other.) Anyway, the video was released in the early-1980s by Random House Video as part of their "Jim Henson's Muppet Video Line." And, if you read the newsgroup alt.tv.muppets you know that by early November, and year 'round actually, tons of people start asking where they can purchase video copies of Emmet. Anyway, it's now on video and comes with a Toy Story Christmas ornament. Buy it today! Miss Piggy made an appearence on Martha Stewart's 1996 Holiday Special. It aired on CBS, Tuesday, December 10, 1996 at 8:00PM Eastern. Miss Piggy shared her recipie for Gingerbread Cookies. Reminds you of another joint Martha Stewart-Miss Piggy appearence? That's because on last year's special (December 12, 1995) Miss Piggy and Martha made a gingerbread house. That's also the recepie Martha shares in Miss Piggy's cookbook, In the Kitchen with Miss Piggy. The other guests were Micheal Jordan (Space Jam) and Dennis (NYPD Blue) & Joanie Franz. The special will also be reran on December 16 at 9:00PM and December 20 at 10:00PM. Nickelodeon is showing three classic Muppet Christmas specials, all of which are now available on video. They are on Nickelodeon, Fridays at 1:00PM Eastern. On December 6 is Emmet Otter's Jug-Band Christmas, on December 13 is The Christmas Toy and on December 20 is A Muppet Family Christmas. Of course, in recent years Nick had also shown the specials on Wednesday nights at 7 (Eastern). SESAME STREET CHARACTERS IN NEW SONY THEATERS SPOTS! Here is the blurb about the Sesame Street characters appearing in new rules spots for Sony Theaters, straight from the Sony site about it. 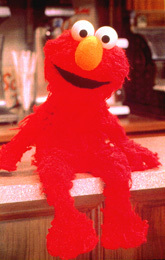 "NEW YORK, August 13, 1996 -- Children's Television Workshop announced that Grover, Elmo, Big Bird and the other Sesame Street Muppets hit the Silver Screen today in a new policy trailer and four Public Service Announcements (PSAs) created exclusively by Children's Television Workshop for Sony Theatres, and its affiliates, Loeks-Star Theatres and Magic Johnson Theatres. The Sesame Street Muppets, created by Jim Henson are already known by more than 120 million viewers worldwide, will appear in the policy trailer and PSAs, scheduled to appear on over 900 movie screens throughout the county for a minimum of one year. "We are thrilled to be featuring the Sesame Street Muppets on our screens. CTW has created a trailer so entertaining that it will certainly add to the overall entertainment experience at our theatres and will surely be loved by all," stated Barrie Lawson Loeks, Chairman of Sony Theatres. "The huge appeal of the Sesame Street Muppets and their unique ability to talk to children and their families is incredible, and Sony Theatres is proud to feature them on the big screen." The two-and-one-half minute policy trailer, which features the entire Sesame Street Muppet cast, entertains audiences while reminding them about polite movie etiquette such as "Don't Talk! ", and "Don't Litter! ", as well as Muppet etiquette, "Don't Surf! ", "Don't Dance with a Bear! ", and, of course, "Don't Munch on a Chair!" The four 30-second PSAs, narrated by Don Pardo, feature "World Changing" messages such as: "Share" with Muppets Rosita and Cookie Monster; "Be Nice" with Grover; "Don't Lose Your Cool" with Bert and Ernie; and "Take Turns" with Big Bird, Elmo and Zoe. "We are very excited that Sony approached us with a project that underscored CTW's mission to delight and educate children and their families," said Allyson Kossow Felix, Vice President Marketing & Communications, CTW. "The PSAs and policy trailer deliver an upbeat, appealing message to audiences of all ages." The policy trailer and four PSAs were written and produced by Sesame Street veterans writers Lou Berger, Tony Geiss, Judy Freudberg, Norman Stiles, director Lisa Simon and producer Arlene Sherman. Sony Theatres, is the seventh-largest theatre circuit in the country, with 850 screens in 140 locations in 14 states. Loeks-Star Theatres, in partnership with Sony, operates 82 screens in 8 locations throughout Michigan. Magic Johnson Theatres, a partnership between Sony Theatres and Earvin "Magic" Johnson to build first-run theatres in underserved minority areas, currently includes one 12-screen location in Los Angeles, with additional locations under construction in Atlanta and Houston. Children's Television Workshop is the world's leader in educating and entertaining children, having reached over 120 million children in more than 130 countries. The Company's expertise expands over a range of media including television, home video, software, publishing, as well as licensed products and community outreach efforts. The Company's roster of projects includes Sesame Street, Ghostwriter, CRO, Creative Classroom, Kid City, 3-2-1 Contact and Big Bag, a new one-hour preschool show which debuted June 2, 1996 on the Cartoon Network. If you want to E-Mail me any comments on this page, send them to [email protected]. Thanks must go to Jon Cooke, Bill Sherman, Rose Sage, Danny Horn, Steve Whitmire, Craig Shemin and others. Visit my home page! The Ted Nesi Page!